In the late 1950s Alistair MacLean (1922-1987) established himself as one of the premier British thriller writers and by the 1960s he was one of the world’s bestselling novelists. MacLean’s popularity was starting to falter by the 80s and continued to decline thereafter although his books remain in print in the UK. Night Without End was his fifth book, appearing in 1959. No less than fifteen of his books were made into movies, including major box-office hits such as The Guns of Navarone and Where Eagles Dare. MacLean’s first novel, H.M.S. Ulysses, was a war novel based on the author’s own experiences in the Royal Navy during World War 2, experiences that had included service on two of the Arctic convoys to Russia. H.M.S. Ulysses was notable for its graphic depictions of the harsh Arctic conditions and after he switched to writing thrillers he would return to such settings again and again. Such conditions were of course ideal for thrillers. They provided opportunities for MacLean to place his characters in extreme danger in isolated locations and they also meant that his heroes would be fighting as much against the harsh and potentially deadly weather as against the bad guys. The hero of Night Without End is Dr Peter Mason. He’s both a medical doctor and a geologist and he’s part of a scientific team based in Greenland, right in the middle of the ice sheet and many hundreds of miles from any habitation. With him are Jackstraw, a half-Danish half-Eskimo scientist, and radio operator Joss London. The other members of the scientific team are currently engaged on a field trip hundreds of miles away. Conditions at the base camp are rather primitive but the three men are accustomed to the Arctic. Being about as far away from civilisation as you can get while still remaining on planet Earth the three are naturally somewhat surprised to hear an aircraft approaching. The only aircraft likely to be anywhere in the vicinity would be US bombers from the Strategic Air Command on exercises or meteorological aircraft from the air base at Thule in the northwest corner of the island. But such aircraft would not be flying at low altitude and this aircraft is flying at very low altitude indeed. So low that it can only be in trouble. The aircraft is in very big trouble and makes a crash landing nearby. To the amazement of Mason and Jackstraw it is a British BOAC airliner, a very very long way from where it should be. There are only a few passengers on board of whom nine plus the stewardess survive the crash. The base camp is certainly not equipped to feed and house ten additional people including several who are injured. Obviously the best thing to do is to radio the field team or the expedition’s base camp at Uplavnik. That’s exactly what Mason intends to do but that idea goes out the window when the camp’s powerful radio transmitter gets smashed. That’s a worrying enough incident but Mason has a great deal more to worry about when he discovers that the airliner’s pilot and one of the passengers did not die in the crash - they were shot dead at close range. The terrifying conclusion cannot be escaped that one of the surviving passengers is a murderer. Actually it’s worse than that, since the pilot and the dead passenger were shot simultaneously in different sections of the aeroplane with guns of different calibre. That means there are two murderers. Having now no way of making contact with the outside world Mason has no means of finding out what might be behind the murders. And there is not enough food for thirteen people. The only option is to set out for the coast but with the field team having taken the only modern Sno-Cat with them they will have to make the journey in the backup snow tractor, an ancient pre-war Citroën of extremely dubious reliability. They are faced with a very long journey in an antique snow tractor with two seriously ill people and virtually no food, and with the knowledge that two members of the party are ruthless murderers. Of course it goes without saying that there is more than murder involved. MacLean liked elaborate conspiracies, especially if they involved espionage, and even more especially if the stakes were high. The stakes here are very high indeed. It’s a classic setup for an exciting thriller and MacLean exploits it skillfully. He’s sparing with the action scenes, preferring to rely on suspense and atmosphere. And he provides plenty of both. It’s easy to point to flaws in MacLean’s writing. His ear for dialogue fails him at times. He makes excessive use of foreshadowing. His characterisation is basic at best. And the romantic sub-plot falls hopelessly flat (MacLean’s romantic sub-plots were always very weak). None of this really matters. The characters have enough distinctiveness for his purposes and the book demonstrates his very real skills which prove to be more than adequate compensations for his weaknesses. The Arctic always inspired MacLean’s considerable descriptive abilities and those abilities are displayed here to their best possible advantage. You’ll find yourself checking your own fingers and toes for frostbite, and trying to take shelter from the blizzards. He certainly knew how to build and maintain suspense. And he knew how to construct intricate plots and how to make them work. He had in fact all the strengths that a thriller writer requires while the weaknesses of his writing were in areas that were more or less irrelevant for his purposes. 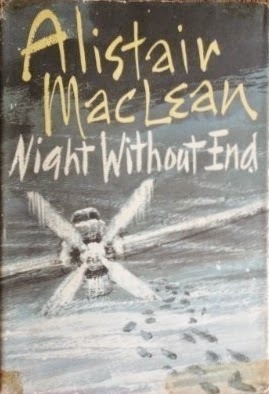 In 1959 MacLean was just starting to reach his peak as a thrillerr writer and Night Without End ticks all the right boxes. An author who does not deserve the relative oblivion into which he has fallen. Very highly recommended. 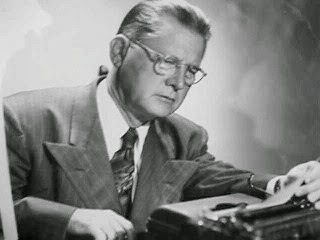 Erle Stanley Gardner (1889-1970) was one of the most successful crime fiction writers of all time, selling well over 300 million books in his lifetime. In the ten years before the publication of his first Perry Mason novel in 1933 he was an incredibly prolific (and incredibly popular) writer of pulp fiction. He aimed to write 1,200,000 words a year and usually achieved his target. That’s impressive enough but becomes awe-inspiring when you consider he was still holding down a day job as a lawyer. In one year Gardner sold no less than ninety-seven stories. This was a man who could write a full-length novel in three-and-a-half days. Gardner’s pulp stories have been overshadowed by the success of the Perry Mason books, and have been somewhat unjustly neglected. The early Perry Mason novels are interesting in that they are stylistically fairly hard-boiled but structurally they’re pure plot-driven golden age detective stories. His early pulp stories are, not surprisingly, somewhat more hard-boiled but Gardner always gave due attention to plotting. He has been accused of being a formulaic writer. There’s some truth to that, but then all genre fiction is (and has to be) formulaic to some degree. Gardner has never really been given enough credit for his ability to create consistently satisfying plots within those formula boundaries. I’ve been exploring some of Gardner’s pulp stories, featuring three of his series characters, and they’re quite impressive. Come and Get It was one of the many stories Gardner wrote featuring Ed Jenkins, the Phantom Crook. It’s more correct to describe him as an ex-crook because he’s now an amateur crime-fighter. Former thieves turned crime-fighter were immensely popular in the 1920s and 1930s, with Blackshirt and Simon Templar (The Saint) being among the best-known. In this story Ed Jenkins has to foil a blackmail plot against society girl Helen Chadwick and in order to do so he has firstly to foil a very ingenious scheme for a jewel heist. The clever plot involves an armoured car. This is very definitely hard-boiled story, and a good one. It appeared in Black Mask in 1927. Honest Money, which appeared in Black Mask in late 1932, was the first of a number of stories featuring lawyer-detective Ken Corning. Gardner only spent one month at law school but taught himself enough about the law to pass the California Bar exam in 1911. Being a lawyer who wrote pulp crime stories it was a fairly obvious move to create a hero who would combine the functions of attorney and detective. Corning was a kind of dry run for Perry Mason, although there are some minor differences between the two characters. Corning is a struggling an idealistic young attorney while Mason is a famous and well-established trial lawyer. It has to be said that while both men pursue unconventional methods Ken Corning seems to have a rather higher regard for legal ethics - for Perry Mason legal ethics are whatever you can get away with without being disbarred. Mason is the more interesting character but the Ken Corning stories gave Gardner the opportunity to experiment with what was at the time the fairly novel idea of a lawyer-detective. Honest Money sees Corning pitted against corrupt city officials. His first case seems like a fairly minor affair. A woman who runs a speakeasy has been arrested for offering a cop a bribe. There are a few puzzling details about the case that lead Corning to suspect that something much bigger is behind this. The Perry Mason novels usually involve a climactic court-room scene but there are no such scenes in this story. By this time Gardner knew what Black Mask readers wanted and he probably felt they’d be more interested in gunplay than in points of law. The Cat-Woman is another Ed Jenkins story. This time around Jenkins has had some financial disasters and he allows himself to be persuaded to resume his life of crime. Or at least he is persuaded to become involved in something that is at best legally dubious. He is to steal a necklace and kidnap a girl, but he’ll be provided with signed statements from the owner of the necklace, giving him permission to steal it, and from the girl, giving him permission to kidnap her. You might think this all sounds pretty suspicious, and that’s exactly what Ed Jenkins thinks. But $10,000 for not actually committing a crime is a tempting offer. Of course it all turns out to be very complicated indeed, and while Ed Jenkins is drawn into a criminal conspiracy he still manages to be a hero. The story was published in Black Mask in 1927 and for a short story it contains an amazing amount of plot complexity. A clever and very entertaining tale. Ed Jenkins features again in a 1930 Black Mask story, Hell’s Kettle. This is a very hard-boiled story indeed, with a prodigious body count and a climax involving not just machine-guns but hand grenades as well. It’s as tough and violent a story as you’re ever likely to encounter. Again he makes effective use of Ed Jenkins as a character trapped between the police and the underworld. Jenkins is a fairly typical pulp hero but with a few intriguing features. There’s a hint of tragedy about him - no matter how hard he tries to escape the world of crime he knows he will never entirely succeed and will always remain an outsider. He deals with this philosophically. Gardner had no interest in self-pity and he wasn’t likely to create a hero who indulged in such emotions. There is however just a touch more complexity to Jenkins than you expect to find in a two-fisted pulp hero. Gardner was often criticised for his poor characterisation, a criticism that seems a little unfair. Both Jenkins and later Perry Mason have some interesting character ambiguities. The Monkey Murder, published in Detective Story in 1939, features yet another Gardner series character, Lester Leith. Leith is another variation on the gentleman-thief and is in fact pretty much an American Simon Templar - he steals but he only steals from other criminals. Such characters usually have a police officer who is determined to hunt them down. The war of wits between the gentleman-thief and his would-be nemesis is an essential ingredient to such tales. Gardner adds a nice touch - Leith’s faithful butler is actually a police spy. And he adds yet another clever twist - Leith knows all about it but doesn’t care because it just adds spice to his adventures. It’s an intricately-plotted and very entertaining story. It’s not the least bit hard-boiled, the style is light-hearted and breezy, and it’s very very close in flavour to Leslie Charteris’s work (which had become enormously popular in the US in the late 30s). Gardner developed a thorough understanding of the fiction market. He could produce exactly the sorts of tough blood-drenched stories that Black Mask readers liked, and when he started writing the Perry Mason books he took a much more sophisticated approach although the pulp influence was still very apparent in the early Mason novels. Gardner was ambitious for success and he had the persistence to achieve it, and the flexibility to vary his style to suit whichever market he aimed at. He seemed to be able to vary his approach at will. He was also hard-headed. When Perry Mason was adapted to television Gardner negotiated the kind of contract most writers can only dream about, a contract that gave him casting approval and final approval of all scripts, in fact virtually complete artistic control. He had the right to veto any suggestions from the network and he exercised that right with enthusiasm. Despite the immense popularity he enjoyed during his lifetime Gardner’s Perry Mason novels are now somewhat under-appreciated. His pulp fiction is even more neglected and deserves to be rediscovered in a big way. 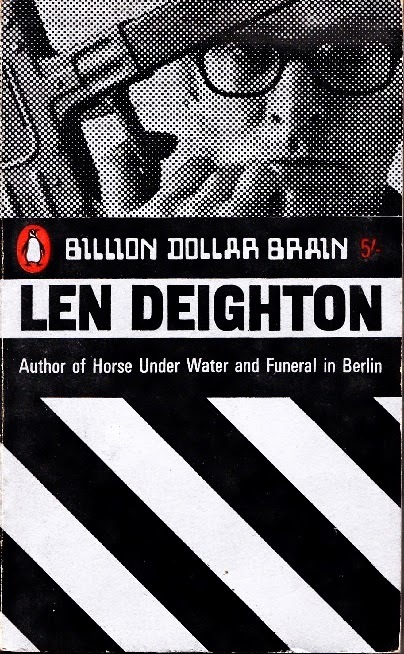 Billion Dollar Brain was the fourth of Len Deighton’s spy novels featuring an unnamed agent of a British intelligence service. When the novels were filmed in the 1960s the character was given the name Harry Palmer. Deighton’s novels are in many ways the antithesis of the James Bond novels. Deighton’s spy is working class, wears glasses and lives in a slightly seedy flat. Unlike Bond he is less than enthusiastic about being a spy, and even less enthusiastic about obeying orders. He is on the other hand an excellent cook and quite the gourmet and despite his slightly down-at-heel appearances he is by no means a mere thug, nor is he a bungler or a fool. He is something of a closet intellectual and can quote Virgil if the occasion demands it (as it does in his novel). It’s probably fair to say that he is quite a bit like Deighton himself. Deighton’s hero may not be enthusiastic about his work but he is a thorough professional and has no patience whatsoever with amateurs. When things go wrong, as they frequently do, it is usually because he has not been given all the information he needs or because he has been set up by his superiors by mysterious purposes of their own. Deighton and John le Carré were seen in the 1960s as ushering in a new era in spy fiction, cynical and realistic and in stark contrast to the glamour of James Bond. Which makes Billion Dollar Brain rather surprising. The plot for this novel is at times outlandish and completely over-the-top - in fact it could quite easily have formed the basis for a Bond film. Convoluted and deceptive plotting was one of the hallmarks of Deighton’s spy fiction right from the start but in this novel the plotting becomes quite spectacularly baroque. As is often the the case with Deighton though, just as you think you know where the plot is going it goes somewhere else entirely. It all starts out as a very routine case involving a troublesome left-wing Finnish journalist. In Helsinki Deighton’s anonymous spy stumbles upon what proves to be a vast private anti-communist intelligence operation run by a fabulously wealthy American billionaire, General Midwinter. Midwinter’s ambitions go well beyond mere intelligence-gathering and propaganda. He seems to be intending to overthrow the Soviet Union single-handedly. To carry out his ambitious plans he has had a computer built from him. Not just a computer, but a super-computer, a computer capable of running intelligence operations on its own. The central character in the novel is not really the unnamed narrator but his old friend Harvey Newbegin. Newbegin is an American and to say that his loyalties are uncertain would be putting it mildly. Harvey used to be a professional American spy but now he works for General Midwinter’s organisation. Harvey is however a man to whom duplicity and betrayal are second nature. He thinks he is clever enough to play off his new employer against the Russians while betraying both parties. It’s a dangerous game and while he is a skillful manipulator it’s obvious that sooner or later he’s going to land himself in very deep trouble, and then he expects that his old friend in British intelligence will come to his rescue. His old friend in British intelligence has his own problems and while he has a certain affection for Newbegin there are limits to his patience. Complicating matters further is Newbegin’s girlfriend Signe, who is playing her own game and who proves to be just as skillful at manipulation. Deighton’s approach might be deliberately unheroic but he certainly has style and his prose is sardonic and drily humorous, and a good deal more entertaining than le Carré’s. Deighton also has the ability to construct plots of byzantine complexity without becoming tedious, and without becoming impossibly obscure. His plots twist and turn in spectacular fashion but while his protagonists are often hopelessly unaware of what is really going on he is careful to ensure that the reader is not left in similar confusion. Deighton’s plots might be convoluted but they do make sense. Billion Dollar Brain is a complex, intelligent, stylish and thoroughly entertaining spy novel. Highly recommended. 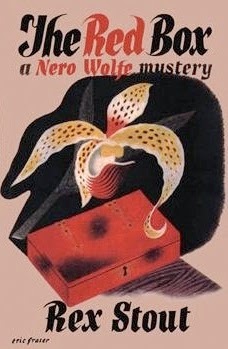 The Red Box was the fourth of Rex Stout’s Nero Wolfe murder mysteries. It was published in 1937. While they are fine examples of golden age detective fiction the biggest attraction of the Nero Wolfe books is quite definitely Nero Wolfe himself - he is one of the most deliriously outrageous of all fictional detectives. He is so outrageous that he is in danger of self-parody but this is a danger that Stout manages to avoid. The Red Box includes one element of which I’m extremely fond and that is found in quite a few golden age detective tales - a bizarre and outlandish murder method. There are actually three murders in the book and all three are somewhat outlandish but it’s the third that really delighted me. I’m certainly not going to spoil it but I will mention that it involves adhesive tape and as Wolfe points out it’s a remarkably economical murder method, involving an outlay of around fifteen cents. The first of the three murders involves a box of candy. Boxes of chocolate were quite a popular way of murdering people in golden age detective stories. In this case it is fortunate that the candy selection involved did not include caramels. Had it included caramels Nero Wolfe’s task might have been made even more difficult. Stout throws in plenty of standard crime fiction ingredients. There’s an eccentric will. There’s a mystery with its roots in the past. There’s more than one suspect with a secret to hide. The ingredients are expertly blended and the results are delicious. Nero Wolfe is at his idiosyncratic best. This case begins with an event that is not quite unprecedented but certainly very unusual - Wolfe actually leaves his West 35th Street brownstone to visit the scene of the crime. In a nice piece of symmetry a later scene of the crime will come to visit West 35th Street. As usual Wolfe and his indefatigable assistant Archie Goodwin will spend a good deal of time trying to avoid offering too much cooperation to the police. Archie will also have to deal with a relapse by Wolfe, although in this case he manages to head it off before too much harm is done and too much time is lost. A great deal of beer will be consumed by Nero Wolfe. Of course we never doubt that Wolfe will solve the mystery but in order to get the necessary proof he will have to take a considerable chance, relying on an elaborate and risky bluff. I’ve been reading the Nero Wolfe novels in sequence (in other words in publication order). I’m not sure that there’s any real necessity to read them that way. It’s more of a personal whim. The Red Box is a treat for golden age detective fans. Highly recommended. 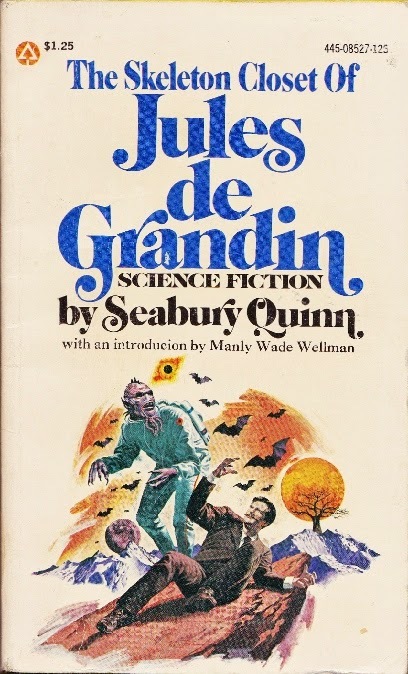 The American pulp writer Seabury Quinn (1889-1969) is best known for his stories chronicling the adventures of occult detective Jules de Grandin, described on the back cover of The Skeleton Closet of Jules de Grandin as “the occult Hercule Poirot” - a reasonably apt description. The Skeleton Closet of Jules de Grandin comprises six of the Jules de Grandin stories, all originally published by Weird Tales in 1929 and 1930. Quinn was very much a pulp writer and while his stories may not have much literary polish they do possess a great deal of energy and flair and Quinn was nothing if not inventive. The Drums of Damballah opens with a series of inexplicable crimes - the murder of a kindly clergyman, the kidnapping of a baby, the theft of a crucifix from a church. To Jules de Grandin it all adds up to a voodoo cult in 1930s New York, planning human sacrifice. Plus there’s an ape-man. I’m something of a connoisseur of politically incorrect fiction and this may well be the most politically incorrect story I’ve ever encountered. It’s also tremendous fun. The Doom of the House of Phipps is a good example of Quinn’s favoured method, taking a very clichéd idea and trying to give it a twist. In this case the clichéd idea is a curse that dooms any male member of a particular family who is unwise enough to marry. They will die with their mouths full of blood before they set eyes on their first-born child. This attempt is perhaps a little too contrived but it’s enjoyable enough. Ancient Egypt and mummy’s curses were incredibly popular in the pulp era but The Dust of Egypt adds some genuinely original and very clever twists involving thought-patterns and belief. A superb little story. The Brain-Thief is almost as politically incorrect as The Drums of Damballah. An evil Hindu uses hypnotism to control people and steal time from them. He steals not only time but their memories. This is a fine example of Quinn’s ability to come up with remarkably clever ideas and to exploit those ideas to the full. The Bride of Dewer deals with the legendary practice of droit de seigneur, which supposedly gave a feudal lord the right to sleep with the newly married brides of his vassals on their wedding night. It’s a legend that remains popular despite almost certainly being entirely imaginary. Quinn turns it into a nice little gothic tale as a demon exercises that right over the course of many generations. Daughter of the Moonlight deals with witchcraft and can also be considered as an unconventional vampire tale, or perhaps it would be more accurate to say that it deals with early conceptions of vampirism that were current before Bram Stoker created the vampire legend in its modern form. Early ideas on vampirism placed great stress on the power of moonlight. A rather grim tale that demonstrates de Grandin’s ruthlessness in dealing with evil. Jules de Grandin might resemble Hercule Poirot in his humorous mangling of the English language but in reality he’s considerably more ruthless. While some occult detective stories offer rationalistic explanations for various mysteries these stories are all avowedly supernatural, or at least they deal with events that defy rationalistic beliefs. One very interesting and fruitful idea that Quinn utilises in several of his tales concerns the power of words and the power of beliefs. Such powers may be supernatural or paranormal or they may be powers of the human mind that science has not yet unravelled. As well as the many short stories Jules de Grandin also features as the hero of one novel, the deliciously lurid The Devil’s Bride. Seabury Quinn’s overtly pulpy style has prevented him from gaining the recognition for his occult detective stories that more literary writers such as William Hope Hodgson have gained but his ability to tell clever and original stories in a very entertaining manner should not be underestimated. Highly recommended. Carroll John Daly is now not much more than a footnote in the history of crime fiction. A footnote, but a very significant one. 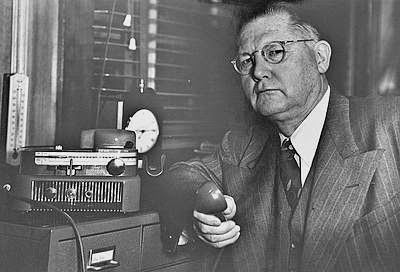 Carroll John Daly, it is generally admitted, invented the hard-boiled detective story. His story Three Gun Terry was published in Black Mask on 15 May 1923 and it was the first story to bring together all the elements of the hard-boiled detective story. Some of the other elements had appeared in earlier stories but Three Gun Terry is the genuine article. It is the template on which every hard-boiled detective story is based. And in 1927 Daly produced the first hard-boiled detective novel, The Snarl of the Beast. You would think that Daly would have gone on to be a very major figure in the genre but it didn’t quite work out that way. Daly contributed dozens of stories to Black Mask over the course of two decades and was popular with readers but he was overshadowed by other writers who took his template and did more interesting things with it. Critics have never found much to admire in Daly’s fiction and even the various editors of Black Mask were not overly impressed by his work. Dashiell Hammett would soon become the darling of hard-boiled fiction fans, critics and the editors at Black Mask. Daly’s most popular creation, private eye Race Williams, would serve as the model for Mickey Spillane’s Mike Hammer. By the early 1950s Spillane was selling books by the tens of millions while Daly was finding it next to impossible to get published. The simple truth is that while Daly was the pioneer the real rewards were reaped by writers who were simply better writers. In their very different ways and despite their very different styles Hammett and Spillane had the genuine talent that Daly lacked. Notwithstanding all that, Three Gun Terry was the story that started it all. In 1923 Black Mask was not even a specialist detective fiction pulp magazine. The stories in Black Mask in the early days covered a wide variety of genres including, amazing as it may seem, romance. It was the immediate popularity of Carroll John Daly’s tough guy private eye stories that caused Black Mask to concentrate more and more on hard-boiled fiction. So why was Three Gun Terry such a sensation at the time, and why was Daly unable to capitalise fully on his innovations? Three Gun Terry is certainly fast-moving and exciting. There’s a great deal of violence and an impressive body count. Private eye Terry Mack has the tough guy attitude in spades. He’s a loner, as a good hard-boiled hero should be. He has an uneasy relationship with the police. He has plenty of underworld connections. He’s perfectly at home on New York’s mean streets. He’s unpolished and he’s cynical. He doesn’t believe in doing anyone a good turn unless he’s getting paid for it. He’s very quick with a gun. In fact he always carries three guns - two big automatics plus a little .25 automatic up his sleeve. He’s just as quick with his fists, and with wise-cracks. He doesn’t trust dames. He’s not the sort of guy who gets invited to the best social functions - he’s more at home in a speakeasy. For all that, he is in his own way a hero. If Terry Mack takes on a case for a client he’ll do his best to deliver the goods even if it means taking big risks. All the right ingredients are there. The problem is that Daly was very much a pulp writer and nothing more. He could tell a good exciting story and do it quite efficiently. He had neither the ambition nor the ability to do any more. There is no attempt at characterisation, no subtlety, no polish. Daly’s writing style is rough and ready and his ear for dialogue is often less than sure. His hard-boiled patter comes off sometimes; sometimes it’s embarrassingly clunky. The plotting is serviceable enough - there’s a conspiracy to cheat a young woman of her fortune, there’s a hunt for a vital document, there are kidnappings and it serves its purpose in providing opportunities for plenty of action. Daly’s first Race Williams story, Knights of the Open Palm, followed hard on the heels of Three Gun Terry. The plot is slightly more unusual - Williams comes up the Ku Klux Klan while trying to find a young farmer’s son who has been kidnapped. Again the plot provides the hero with the chance to indulge in copious amounts of gunplay. Daly had no great skill in creating suspense but he makes up for it with plenty of action. Race Williams is hardly distinguishable from Terry Mack. You certainly get the sense that both Terry Mack and Race Williams see violence as more than just a necessary part of the job. They enjoy it. They make Mike Hammer seem like the quiet sensitive type. It’s probably harsh but fair to describe Daly as little more than a hack, but he could be an entertaining hack and his writing unquestionably has a great deal of energy. Three Gun Terry is worth reading for its historical interest but while it’s crude it’s quite enjoyable. 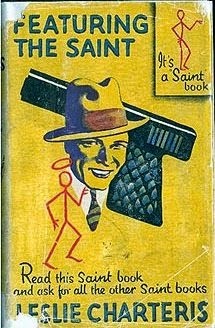 Featuring the Saint, published in 1931, was one of Leslie Charteris’s early books about his famous hero Simon Templar, the Saint. It is a collection of three novellas. Charteris could write short stories and novels quite successfully but he was particularly fond of the novella, a form that suited his talents to perfection. 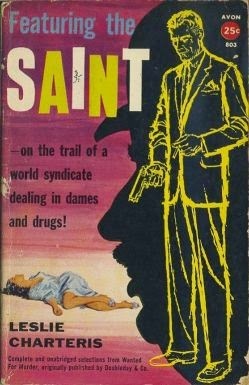 The first of the novellas is The Logical Adventure, in which the Saint takes on impresario and crook Mr Francis Lemuel. His first step is to secure employment as Lemuel’s private pilot, an occupation which will afford the Saint ample opportunities to display his daredevil qualities. He has discovered that Lemuel is involved in large-scale cocaine smuggling. The Saint has no particular problems with bending the law a little himself but drugs and destroying people’s lives are another matter. Even in the days when he was on the wrong side of the law he had always been a very moral sort of outlaw. This adventure promises the opportunity to bring an evil man to justice and quite likely enrich himself somewhat as well, and that’s the kind of adventure he’s most fond of. This affair ends up being rather more serious than he’d anticipated and it appears that murder may be the only way to resolve it. Well, there are times when murder can be a public service. The trick of course is not to end up getting murdered oneself. There may also be some difficulties with his old friend Chief Inspector Teal, but those difficulties are unlikely to be insurmountable. The Wonderful War sees Simon Templar in a different role, as a revolutionary in Central America. These were, as he explains, the happy pre-Castro days when revolution was more of a sport than anything else. The Republic of Pasala has, oddly enough, never had a revolution. And Simon has never actually organised a revolution. But really, how difficult can such things be? He only has a few weeks to spare but that should be ample time. The army of Pasala, comprising 500 enlisted men commanded by no fewer than seventeen generals, is unlikely to be a major problem. Simon will discover that organising a revolution is every bit as much fun as he’d expected it to be, and only slightly more difficult. And it’s not as if he has to do it all himself. He has his old friend Archibald Sheridan to help him and they can also rely on invaluable assistance from a drunken Irishman named Kelly. Simon is not fomenting revolution for his own entertainment (although he will derive a great deal of amusement from the undertaking) - there is a lady whose fortune has been stolen from her and Simon Templar is not the man to ignore a lady in distress. The Man Who Could Not Die pits the Saint against Miles Hallin, a sportsman, adventurer and entrepreneur (of the shady variety of course). Hallin is famous as The Man Who Can Not Die and indeed he does seem to have cheated death with remarkable success and with equally remarkable frequency. Simon has a theory about this, that a man who cannot die is likely to be a man who is in reality inordinately afraid of death. He tries to explain the details of his theory to Patricia Holm (his lady love at this stage of his career). It’s somewhat obscure to her but she has no doubt that somehow or other it does make sense to Simon. Simon has also come to suspect that a man who cheats death so often may in fact have done so at the expense of others. Perhaps Miles Hallin cannot die but people around him seem to do so with unusual frequency. This is the very early Saint, when Charteris’s hero was simultaneously both more carefree and rather darker than his later incarnations. Certainly rather more ruthless. The early Saint’s methods for dealing with the ungodly were frequently quite extreme and often very final. As you would expect the Saint still finds time to improvise verses and sing or song or two. It’s all part of the fun of getting mixed up in adventures. All three novellas are tremendous fun and The Man Who Could Not Die in particular is vintage early Charteris. Highly recommended. 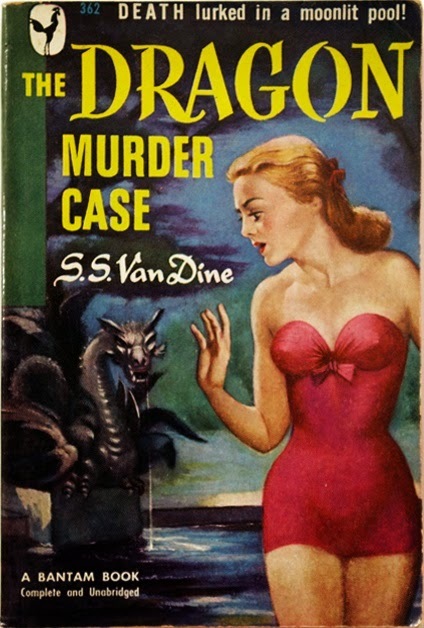 The Dragon Murder Case, published in 1933, was the seventh of S. S. Van Dine’s twelve Philo Vance mysteries. I think it’s one of his best but that’s not a view that has been shared by some important critics of the detective story. In his very influential study of the detective story, Bloody Murder, Julian Symons takes a surprisingly positive view of the first six Philo Vance books but is contemptuously dismissive of the last six. That dismissal has been widely echoed but in the case of The Dragon Murder Case it seems a little unfair. The Dragon Murder Case has most of the features you expect in a Philo Vance novel. The plot is intricate, the murder method is bizarre and spectacular and Philo Vance is in very Philo Vance form. The latter is either a very good thing or a very bad thing depending on how you feel about Vance, and that is very much a matter of personal preference. I can understand those who find Vance irritating and who dislike Van Dine’s style although personally I find both to be highly entertaining. I like footnotes. I can’t help it. In an earlier Vance book Van Dine had already dealt with criticisms of Vance’s English accent by pointing out that he had been educated in England. Anyone who spent their formative years in England (and given Vance’s social position this would have meant one of the great public schools followed by either Oxford or Cambridge) would naturally have picked up some upper-class English mannerisms and some trace of an accent. Philo Vance was the sort of hero that Van Dine wanted and the success he enjoyed suggests that most readers were happy with such a hero. The setting for The Dragon Murder Case is the vast Stamm estate in New York City. Rudolph Stamm and his sister are the last of their line and Rudolph is a character right out of gothic fiction. He could be the protagonist of one of Poe’s stories. In fact there’s quite a marked Poe influence in this tale. Homicide cop Sergeant Heath has been called to the Stamm estate after a guest had decided on a swim, dived into the Dragon Pool and never emerged. It seems like a straightforward accident but there is something about the atmosphere in the Stamm mansion that Sergeant Heath is very unhappy about. He feels that this is a case that District Attorney Markham should take a look at. In fact he’s probably even more anxious for Markham’s friend Philo Vance to take a look. Having worked with him on previous baffling cases Sergeant Heath has developed a great respect for Vance’s crime-solving abilities. Markham is rather annoyed at being called out to investigate what seems to him to be clearly an accident but Vance is inclined to think that Heath’s instincts may be right. When the Dragon Pool is drained it becomes obvious that this is no accident. It should be explained that the Dragon Pool is not a swimming pool but an artificial pond of considerable extent, and considerable depth. This is in some ways a classic example of an impossible crime story. Adding extra spice (and even more gothic atmosphere) are the old Indian legends attached to the Dragon Pool, legends of an actual dragon. The Dragon Murder Case is a fine example of the fair-play mystery. Van Dine is scrupulous about giving us the necessary clues to both the murder method and the identity of the murderer. R. Austin Freeman said that clues should never be hidden. They should be left in plain sight, and the writer should rely on the reader’s endless capacity to miss their significance. This is what Van Dine does. The really important clues are all right out in the open. Freeman also felt that the writer should never cheat by laying false clues. Van Done does make one use of a false clue in this book, but it’s done in such a way that the alert reader should be suspicious of it from the start. My own view is that the writer also needs to play fair psychologically - the reader needs to believe that the killer is not only the only one who could have physically committed the crime, but also the only one with the right psychology to have committed it. That means more than just a convincing motive; the killer needs to be the sort of person who would commit murder, and do so in the manner in which the murder was actually carried out. Van Dine is careful to do that in The Dragon Murder Case. The solution might be wildly outlandish but it still rings true psychologically. One of the conventions of the golden age detective story is that there should be a limited number of suspects. A popular way of doing his was to put the suspects in a location that is physically isolated from the outside world, thus eliminating the possibility of an outside killer. In this book Van Dine handles the situation more cleverly and more subtly. The estate is not cut off from the outside world but the crime happens in such a way that only the small group of people staying at the house could have had the one essential piece of information that made the crime possible. The killing is also done in such a manner that the killer must have been very familiar with the geography of the estate. An outsider could certainly have entered the estate, but an outsider could not have done this murder. What this means is that the extraordinary setting Van Dine has chosen is not just there to provide a colourful backdrop. It plays a crucial plot rôle. It would not be going too far to say that this is a murder that could have taken place nowhere else in New York. The Dragon Murder Case is outlandish but wonderfully entertaining. Van Dine’s style might strike some critics as overblown but it’s perfectly in keeping with the nature of the story and its setting. Tremendous fun, and highly recommended.